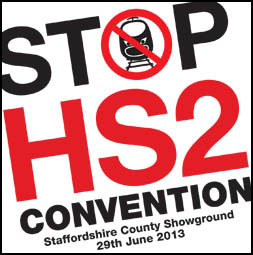 STOP HS2 | Hundreds expected for National Stop HS2 Convention. Campaigners from the entire 351 mile proposed route of HS2 will descend on the Stafford County Showground on 29th June for the second Stop HS2 National Convention. With 30 sessions covering all aspects of the HS2 project and campaigning against it, the convention will provide a ‘crash course’ on HS2 for people coming in to the campaign following the announcement of the Phase 2 route earlier this year. All of the main groups opposing HS2: Stop HS2, HS2 Action Alliance, AGHAST and 51m will have a presence, with both the Woodland Trust and the Wildlife Trusts explaining the environmental devastation which HS2 would bring. Economics professors will explain the holes in the business and economics cases and amongst other sessions, there will be experts talking about noise, compensation, mitigation, dealing with HS2 Ltd, fund raising, using social media and what people can do to forward the campaign. Politicians taking part in a Question Time session will include Conservative MP Bill Cash, UKIP MEP Mike Natrass and Deputy Leader of the Green Party, Will Duckworth. Tickets are available via the Stop HS2 website at a cost of £10. After the costs of the eveny have been covered, any profits will go towards campaign funds. To help with scheduling, people will be asked to give an indication of which sessions they would prefer to go to when buying tickets. It is hoped that communities can co-ordinate who goes to which event so they get the most out of the day. Registration starts at 9.30, with the event closing at 5.30. The Stafford County Showground is effected by the line of HS2, as was the venue for the 2011 convention in Stoneleigh, Warwickshire. “There are a lot of people out there who have had HS2 dumped on them and don’t know what to do, but the will if they come to the convention. Besides all the sessions we are running, there will be a great chance to network with other people on Phase 2 and people on Phase 1 who have been living under the same shadow for three years. If the appeal case(s) require a decision in the European Court about the use of the Strategic Environmental Assessment SEA in the UK the Convention would be a helpful opportunity for people to lodge their local and personal examples for evidence in that future case. This is used to provide high level of protection and to promote sustainable development. HS2 one track each way is not sustainable development as Beeching discovered and HS1 discovered you need train demands Hence the addition of the Javelin with integration into Network Rail. These are not designed into the HS2. 4 tracks would not provide the integration for Route 3. The Convention could identify for the case where there is not the high level of protection. For example loss of amenities and splitting of villages and homes. The Convention is an excellent venue to obtain all the local issues on paper for the case.